Stretching across Russia, Mongolia, Kazakhstan and China, the Altai-Sayan ecoregion is one of the last remaining untouched areas of the world. PA4LP is making sure that it remains this way. Enhanced protection - 313,000 ha of protected areas established, committment to 10.8 million hectares of new protected areas in the next 10 years. 29 new PAs have been approved for establishment by 2020 by the Russian Ministry for Natural Resource and the Environment. Sailyugemsky National Park (118,000 ha), on the border between Russia and Mongolia, was established in February 2010. 3 Mongolia PAs covering a total area of 638,510 ha were official gazetted. Additionally, A local level PA covering 70,000 ha has been established in Achit Lake Depression. Transboundary cooperation - Joint management, research and monitoring systems established for PAs. Joint work plan for eco-tourism in Altai-Sayan developed. MOU signed to establish information centers, strengthen joint tour itineraries, and review legislation on tourist visas. Tourism monitoring for "Altai" protected areas was strengthend when Russian specialists shared tourism monitoring methodology with their colleagues in Kazakhstan. Socio-economic benefits from PAs - New and more secure sources of income for local communities. Ecotourism projects developed around PAs in two administrative regions in Russia's Tuva republic. Sustainable hayfirelds initiated in the area around Katon-Karagay National Park. Implementation of the Altai-Sayan network funding strategy. Identification of strategies for additional funding in the Altay and Tuva Republics, as well as Krasnoyarsk Kray. Enhanced human capacity - Effective management of PAs. 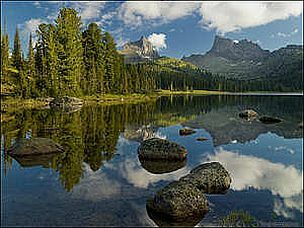 Two training centers for regional protected areas have been established for the first time in Altai-Sayan. More than 500 individuals have been trained through workshops. Identification and protection of key ecosystem services. Economic valuation of PAs and promotion of payment for ecosystem services (PES). Promotion of natural capital accounting among governments and the private sector. Continuing to implement Mongolian and Russian Federal Gap Analyses. Creation of ecological corridors to link PAs into networks, including transboundary corridors. Replicate effective PA management and sustainable financing mechanisms in other regions. Replicate PAs-local community partnerships in other regions. Early 2011: Russian government agrees to creation of the "Altai" transboundary site with Kazakhstan. October 2010: Russia conducts a first of its kind review of implementation of CBD targets on PAs and presents the results at CBD COP10, in Nagoya, Japan. October 2010: Mongolia's first national gap analysis is launched at CBD COP10, in Nagoya, Japan. July 2010: An innovatie “virtual museum” is launched in the Katon-Karagaiskiy national park and Markakol zapovednik. July 2010: Russia commits to protecting an area almost the size of Switzerland. May 2010: Mongolia celebrates the Biodiversity Day in the context of the International Year of Biodiversity. February 2010: The Sailyugemsky National Park (118,000 ha) is established in Russia’s Altay Republic on the border with Mongolia. April 2009: The first Gap Analysis of Russia’s PAs system identifies 566 sites in need of protection. Watch Cheranev Vladimir Gennadievich, Director UNDP, Kazakhstan talk about partnerships being built.
" The United Nations Development Programme and the Global Environment Facility in Kazakhstan, together with PA4LP, have helped build strong partnerships." Mongolia woman capturing goat for milking. PA4LP is ensuring that local people benefit from new and existing PAs.